With several locations throughout Jamaica, Madden’s Funeral Home exists to help you deal with the death of a loved one. We believe that every life, whether lived quietly or bigger than life itself, is unique and deserves to be honored. Our staff of funeral directors are experienced professionals who are devoted to helping you honor the memory of your loved ones. Your family deserves a funeral home whose staff is caring and compassionate. Contact us if we can be of assistance to your family with any services we offer, such as pre-need planning,traditional funeral services, cremations services, grave side services, or any other requirement you may have. Our commitment for over seventy years has been to assist those who have been touched by such a loss with dignified, personal service at a reasonable, affordable cost. 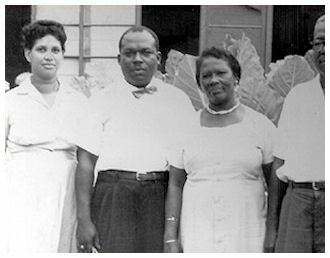 In this picture: Husband and wife, Inez and Ferdinand (left) along with Ferdinand’s parents, Hazel (daugher of Solomon & Elizabeth Hibbert) and Leslie Madden (right). When Leslie Madden built his first coffin under a huge guinep tree on North Street in Kingston, little did he know that the name Madden’s would stand out as a beacon and as the leader in professional final care services. Today, the legacy lives on, and the third and fourth generation Madden clan continue to operate the business in the same vein.